No desire to carry heavy loads? Then use Lithium Ion Batteries from Rebelcell! GET FOR FREE: 5kg IB Carptrack CRAWFISH Boilies! -Better Performance! Full power until the end. Lead batteries are known to lose power well before they are empty and then you do not have that needed thrust! -Environmentaly friendly. Lithium = natural salt. They are leak proof and are much more earth friendly than standard lead batteries. How can I understand? 50AH li-Ion= 105AH lead battery? Peukert-Rule: The effective capacity of a lead battery is dependent to a large degree on the amount of time over which the charge dissapates. A 12V 105AH battery has its best efficiency when it is over a period of 20 hours which it loses its charge. In the following practical example, with the assumption that we use the lead battery to a point of 70% empty (which is not good in the practice and which greatly reduces the life expectency of the battery): A 12V 105AH has a relativly good efficiency when it is used over a period of about 20 hours. The same battery has only 70AH of pwer when it loses its charge in a period of an hour. This has to do with the inner workings of the battery. In other words when the e-motor is used at its fullest force much heat is produced. This heat results in a great loss of performance. It can be seen when a fully loaded boat is used to move locations. 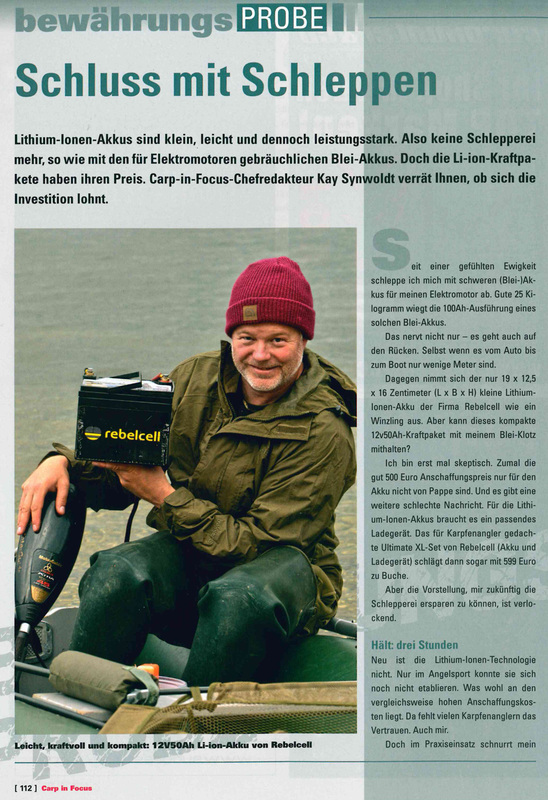 The power is drained from the battery at a much higher rate than when we simply use it to set up or out to drill carp. This is a demonstration of the Peukert-Rule. The capacity of a Li-Ion battery is not influenced by a longer or shorter period of use. That means that the capacity of 50AH is always 50AH no matter if we use the full charge in one or twenty hours. It is also true that lead batteries are affected by the outdoor temperatures, especially in winter is the loss of performance great. The placing of a lead battery in a cold garage without a charge over the winter in the death of that battery. This is not the case with Li-Ion batteries! Lead batteries should not be run down past 50% or a max of 70% empty over longer periods of time. Only then can one expect the full life cycles of 300-400. But in reality, especially with fishing it is often the case that the battery is run until completly empty. This greatly reduces the length of service we can expect from the battery as well as the ability of the battery to continue to store energy. Li-Ion batteries can be run to 100% empty and there is no reduction in performance or length of life. Thus they are the perfect batteries for us! As a reminder- we are comparing a Li-Ion battery at 4,9kg with a lead battery weighing 35kg!! And as a reminder we are comparing a Li-Ion battery which weighs only 5,7kg to a lead battery with 35kg! When all the factors are evaluated the 12V 50ah Li-Ion battery has about the same capacity = (length of use with e-motor) as a 12V 105Ah lead battery! 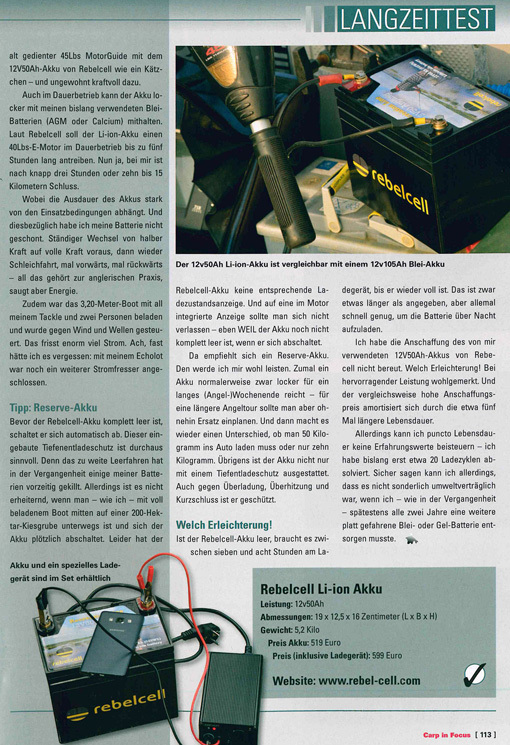 There are a few pioneers from Belgium and Holland who have been using the Rebelcell Li-Ion 50AH battery for some time. They report that the performance is the same as a 105AH lead battery when it comes to length of use with a charge, and capacity. They also report that there is a constant amount of thrust given up to the point when the battery is empty. This is not the case with a lead battery especially when fully loaded or with wind. You need that full thrust ability right up the the end. Not a battery which slowly gives worse and worse thrust until it dies. - A cheap 105Ah lead battery with charger is not to be found under 300 Euro, probably 100 Euro more! - Li-Ion batteries can be recharged 5X more often. Even for extreme anglers there is a ten year life expectency! - Who can really say that they are still satisfied with their lead battery performance after 3 or 4 years? When you were to buy another lead battery to replace the poor performing one then you are already at the price of a new Li-Ion battery. And with 30kg less weight you are getting all the benefits already listed. If even after reading this article you still are not interested in purchasing a Li-Ion battery then atleast you have been reminded to take better care of your lead batteries. Leaving them undercharged in the cold gargage or driving them „to the last drop“ will be the death of them.